2) Click on the “Add a site” button at the top of the screen. 4) Select the method you would like to use to verify ownership. You can either upload an HTML file with a name we specify (which is not possible with Google Blogger account), or you can add a META tag to your site's index file. 5) Under Alternative Methods Click Add a meta tag to your site’s home page. 9) Just below of it, paste the META code and then click on the Save Template button. 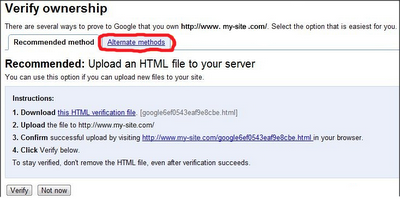 10) Switch to Google Webmaster Tools tab and press on the "Verify" button.